Some RVers choose to avoid the crowding and hustle and bustle of the regular camping season by venturing out for a winter stay at their favorite RV park or state park campground. The days are short, and temperatures may plunge but if you and your RV are ready for the elements, you’ll surely enjoy the peace and quiet of a wintertime camping trip. Below are five steps vital to preparing for an offseason camping adventure. Most late model RVs and trailers are designed, built and insulated to take cold weather in stride. Even when that’s not the case, there’s plenty you can do to make your older RV or trailer warm and cozy. If you expect the temperature to be much below 32 degrees, you’ll want to winterize your rig by draining black and gray water tanks and adding about a quart of special pink RV antifreeze to each. Remember to bring along extra jugs of water for drinking and flushing. A better plan might be to add holding tank heaters and electric pipe heaters to protect pipes draining into the tanks. Note: You’ll need an electric hookup or a generator to power the heaters. Examine the weather stripping on all exterior doors, storage compartments and access panels and replace if necessary to help reduce cold drafts. Check window seals and re-caulk where needed. If you don’t have dual pane windows, there are several things you can do to help keep out the cold. Add insulated curtains, keeping them closed to trap in warm air. Cover windows on the inside with foil-backed foam insulation, or window-insulating film, both available at most home improvement stores. Test and clean your furnace before you hit the road. If your rig has only a heat pump or heat fins (systems that don’t work well when temperatures drop below 40 F), you should take along an additional heat source, like a small electric space heater or, at the very least, a pile of extra blankets. If you use propane to heat your rig, make sure your tank or bottle is full, and check to be sure there’s a refill station at or near your camping destination. 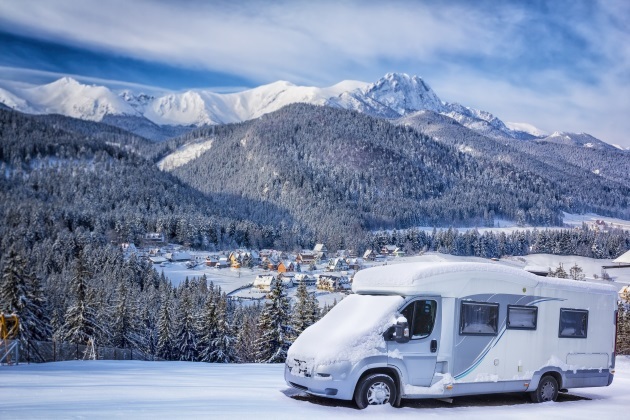 If there’s any chance you’ll encounter sub-freezing temperatures, check your RV’s cooling system. If it’s a sealed system, you’re good to go. Otherwise, you may need to add antifreeze. Same goes for your windshield washer fluid, which should be drained and refilled with freeze-resistant fluid such as Rain-X — or just plain old isopropyl (rubbing) alcohol. Your choice of a winter camping destination obviously will depend upon campground availability. Campgrounds in mountain locations or areas where winter comes early and stays late often close in September and don’t open again until June. Be sure to check the status of all campgrounds at or near your destination and along the route you’ll be traveling. Meteorological advances in recent years have led to somewhat more reliable weather forecasts. Check the following sources for 7-10 and 14-day forecasts as projected for your camping destination: National Weather Service, Weather Forecast, The Weather Channel, and Accuweather. With fewer campers to accommodate, many campgrounds restrict off-season camping to a smaller area of the campground — so you may find your favorite space, loop or section off-limits or without hookups. Water can be an issue at parks that experience below freezing weather. Some parks turn off water spigots at campsites and close all or some of their showers and restrooms. Others may provide water only at specified frost-free faucets. The swimming pool will no doubt be closed but call or email the park to ask about utilities and other amenities such as the laundry and camp store. If the store will be closed, find out if there are grocery stores nearby so that you can pack food and other essentials accordingly. A final suggestion: if it’s not already offered, be sure to ask for an offseason discount. With these tips in mind, you’ll be prepared to extend the joys of RV camping well into the winter season.